There’s something just so comforting about breakfast (bacon? it's probably the bacon) that makes your mouth want it pretty much any time of day: morning, midday at brunch, and late-night after some bad decisions. Break your fast at all hours of the day at these spots that believe breakfast should be served up during all operating hours (which, for some of them, is all 24!). 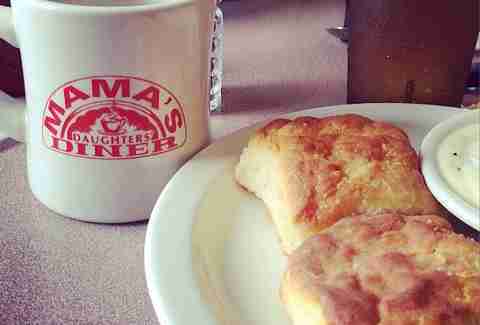 Breakfast doesn’t get more country than at Norma’s, which has plated home-cooking favorites on Davis Street since 1956. The so-named “eNORMAus” breakfasts feature belt-busters like the gigantic meat-lovers omelet, full stacks of pancakes with your choice of pork product, and the hulking chicken fried steak-centered Country Breakfast. Big Eaters (a ribeye platter with three eggs, biscuits and your choice of cinnamon roll, grits or hash browns) is clearly made for those days your stomach wakes up well before you do. Folks dig this little box of a restaurant for its fresh ingredients, including produce and herbs from its own garden that go into the all-day breakfast/brunch service. Granted, that day ends at 3pm, but that’s plenty of time to sink your teeth into house-made bacon, pancakes in three varieties, and egg dishes aplenty. The Country Boy Benedict (biscuit w/ ham, gravy, and eggs over-easy) will ease any concern you might have about dining in too close proximity to a vegetable garden. 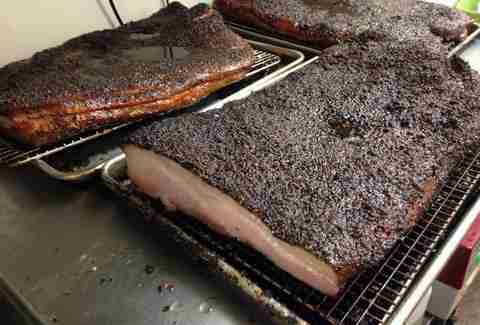 Same goes for that house-made bacon pictured above. If you can’t get your own mama to whip up a homestyle breakfast for dinner (and even bribes don’t work), truck on over and let someone else’s mama fill your belly. This family-owned mini-chain (with additional locations in Irving, Plano, Lewisville and Forney) specializes in huge plates of all your favorite breakfast things: think pecan waffles, scratch-made cinnamon rolls and fried egg sandwiches. 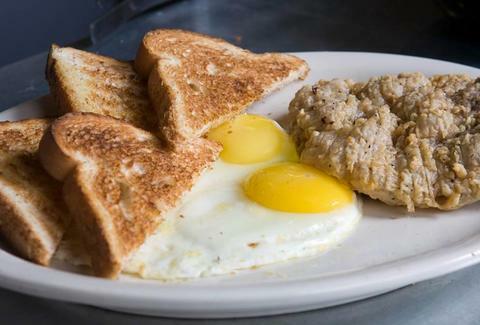 Blue-plate specials like the Texas Size Breakfast (two eggs, hash browns, grits, and toast with three slabs of meat to choose from) will have you stuffed and in food coma-territory in no time. 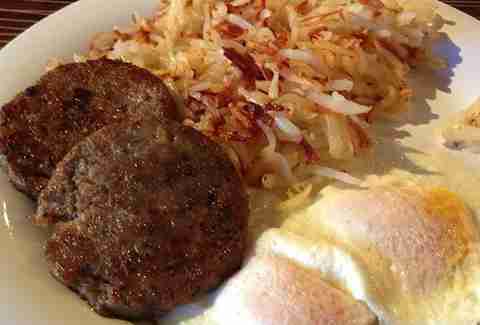 Wee-hour breakfast cravings demand a 24-hour diner situation, and Buzzbrews delivers. The Deep Ellum and Central Expressway-off-Fitzhugh locations provide prime people-watching, especially when the club crowds flood in after 2am -- though it’s tough to look up from a stack of Pit Grill Pancakes or griddle toasts. If you’re part of that club crowd, you’ll want something hefty and meaty like the chorizo-stuffed crepes (called the Bluto Blast), or the Mile High, with scrambled egg whites, veggie sausages & walnuts piled onto a griddle toast... which is less virtuous than it sounds. This Uptown eatery is an updated play on Coney Island joints -- those inexpensive 24-hour greasy spoons in Detroit so popular with after-hour revelers and poor students. Or maybe it’s a back-dated play: ’80s pop culture oozes from every corner, down to the music blaring through the speakers; even DJ and karaoke nights are centered on tunes from the era. 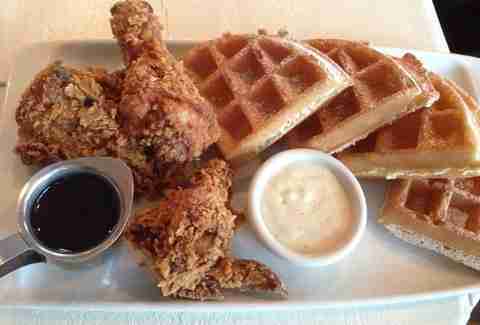 Which goes great with the classic breakfast entrees and specialties like fried wings & waffles and Pop Pancake Sliders. Possibly an even better pairing? An adult milkshake from the full bar -- especially if your breakfasting well past breakfast time. Everyone’s favorite spot for extreme waits for weekend brunch also serves some of those daytime favorites on the evening menu. The "breakfast for dinner" category features fried chicken & waffles that boast the distinction of marrying maple syrup and hot sauce; a croque madame; and a French ham Benedict balanced precariously upon a croissant. So forget the lines: order at primetime. Any place that puts this much focus on craft coffee and rotating pancake flavors has got to be serious about breakfast. 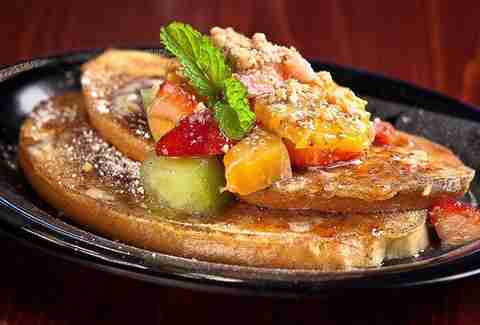 From the fresh-squeezed juices, to boar chorizo-goat cheese skillets and banana cream pie French toast (! 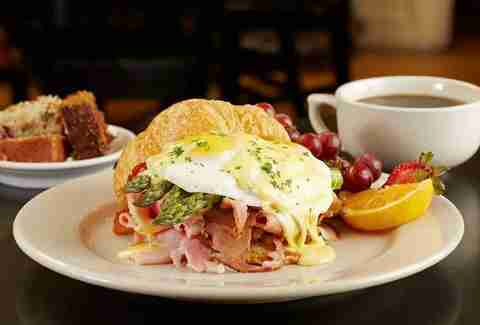 ), this indie coffee shop/diner takes a decidedly chef-y approach to the best meal of the day, from morning to night. It’s best to just roll out of bed and straight into the car when choosing to visit this diner, known for its over-the top entrees. Because not only could you potentially get ahead of what’s usually a considerable wait (on weekends), but also, by the time your stomach wakes up (it’ll happen around the time the fourth or fifth plate of pancake batter-fried sausages passes by), you’ll be seated and ready to gorge. 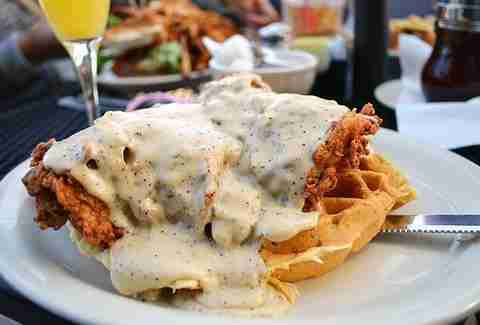 Be sure to bring friends, because the enormity of platters like The Kure (biscuit base with a tower of eggs, gravy, cheese & sausage) and the fried chicken & waffles almost demand sharing.